A 54-year-old woman, heavy smoker (30 packs/year) presented with 1-month of dry cough, in association with intermittent mild haemoptysis. She denied other complaints, has no remarkable medical problems and was not on any medications. She looked well, and physical examination was normal. Chest X-ray showed a mediastinal mass, and chest CT scan confirmed a heterogeneous pretracheal mass extended from the upper third down to the main carina. 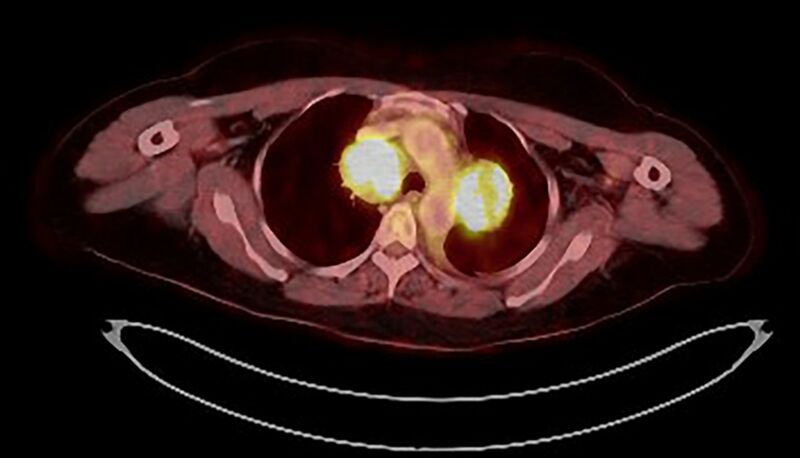 PET-CT scan demonstrated increased standardised uptake values, without extra mediastinal involvement (figure 1). Chest CT scan showed a heterogeneous mediastinal mass. PET-CT scan demonstrated increased standardised uptake values. In order to obtain histopathological samples, an endobronchial ultrasound with transbronchial needle (EBUS-TBNA) aspiration (Olympus EBUS-TBNA needle, Japan) was performed. Four punctures with a 21-gauge needle were taken at the right aspect of the mid-trachea. Samples were fixed in 10% formalin and processed as a cell block. Rapid on-site evaluation was not performed. Histology demonstrated a highly cellular tumour composed of sheets of discohesive small to medium-sized cells with increased nuclear-to-cytoplasmic ratios and round or lobulated hyperchromatic nuclei. The initial pathological approach was of an undifferentiated malignant cell tumour, with an immunohistochemistry panel including cytokeratin (AE1/AE3), vimentin, cluster of differentiation (CD)45 and S100 protein. Cells were positive for vimentin and S100 protein, precluding epithelial differentiation and suggesting a mesenchymal or melanocytic neoplasm. Immunohistochemistry was completed with human melanoma black 45 (HMB45) (+), SRY box-10 (+), epithelial membrane antigen (EMA) (−), CD4(−), CD43(+), CD30 (−), anaplastic lymphoma kinase (ALK) (−), CD4 myeloperoxidase (−), confirming small cell melanoma (figure 2). Left: Sheets of discohesive small to medium-sized cells with hyperchromatic nuclei and scant cytoplasm (H&E stain; ×400). Right: Strong nuclear expression of melanocytic marker SOX10 in the neoplastic cells (SOX10 immunostain; ×200). A primary melanoma of the mediastinum is an extremely infrequent disease. 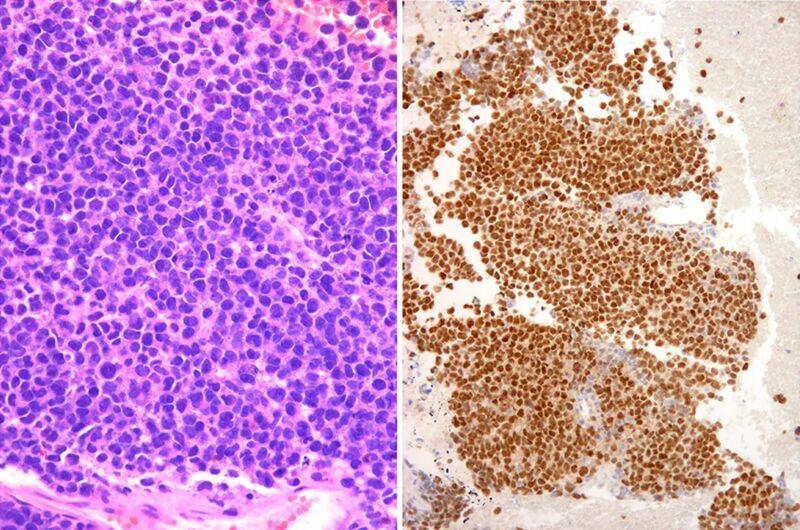 A CD43 (+) small cell melanoma presenting as an isolated mediastinal mass has never been reported. CD43 expression represents a potential diagnostic pitfall and distinction from lymphoma can be difficult if one or more melanocytic markers are negative.2 Diagnosis was achieved by EBUS-TBNA, an outpatient minimally invasive approach to the mediastinum. The patient refused initial treatment and was lost to follow-up. Contributors SF-B and GL: conception, data acquisition, redaction, critical review and final proof-read. GL and AC: conception, data acquisition, critical review and final proof-read. IC: data acquisition, redaction, critical analysis and final proof-read.